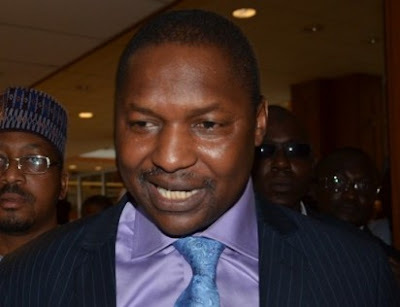 ABUJA—The Attorney General of the Federation and Minister of Justice, Mr. Abubakar Malami, SAN, yesterday, gave Attorneys-General of the 36 states of the federation the nod to prosecute federal offences.
. “The body commends the decision of the Honourable Attorney-General of the Federation to grant a general fiat to states AttorneysGeneral to prosecute federal offences in their respective states on behalf of the Attorney-General of the Federation. “The body further urged the AGF to publish the said fiat by way of Legal Notice duly gazetted,” the communiqué read. Abubakar Malami (SAN) The body equally adopted the proposed National Policy on Prosecution, Code of Conduct and Guidelines for Prosecutors in the country. Meantime, the AGF, said the step would enhance quick dispensation of criminal cases and reduce the number of awaiting trial inmates in the various prisons across the federation. He said the adoption of the policy as well a the Administration of Criminal Justice Act, 2015, by states, would promote effective and efficient criminal justice administration. Besides, Malami stressed that the policy, if effectively adopted, would also remove impediments to speedy dispensation of justice, protect the society from crime, protect the rights and interest of defendants, victims and the Nigerian society. However, he noted that there is fear that a national and uniform adoption of the policy document would infringe on the autonomy of the states, saying such fear was unfounded. He explained that the policy only sought to provide framework for all prosecutors and prosecuting agencies in achieving higher prosecution standards. According to the AGF, “The beauty of having a policy as opposed to legislation lies in its flexibility. “The policy will serve as basis for sound philosophy and practice for our teaming prosecutors and a guiding code that would be respected and observed by all. “A policy has the capacity to be adjusted without the controversies associated with amending legislation.” On its part, the body of AGs pledged to set aside party affiliation and collaborate with FG in the ongoing war against corruption in the country.